St Birinus School aims to develop its own leaders by elevating its most promising staff to roles shadowing the senior team. Jim Fuller explains. It was estimated in 2008 that as many as 55 per cent of heads would be leaving the profession by 2012. There was talk about the ‘demographic time bomb’: the shortfall in the numbers of people with the skills and experience to take over from the high proportion of senior leaders who were likely to retire. St Birinus, a comprehensive for boys in Didcot, Oxfordshire, felt the effect as five members of the 2008 senior leadership team (SLT) have now retired. And yet we have managed to maintain and even improve standards. 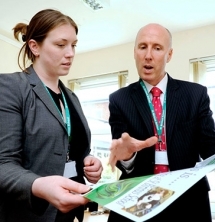 This is due at least in part to a programme known as the Shadow Senior Leadership Team (SSLT), started by the then-head Chris Bryan to meet the succession management needs of our own and other local schools. The new head, Alwyn Richards, has built on the work started by his predecessor. In the last four years, 13 people have taken part including two members of the current senior leadership team (SLT). In addition, three shadow SLT members have been promoted to posts in other schools and the SSLT has become a partnership activity with other local schools including Didcot Girls’ School, Faringdon Community College, Fitzwaryn Special School, King Alfred’s (Wantage) and Wallingford School. The programme did not target middle leaders alone as we had some very talented fast-track teachers to whom we also wanted to appeal. So it was set up to attract the very best colleagues across the school. The process was also made as formal as possible. The scheme was advertised in the school bulletin, as a normal promotion would be, and written applications were requested. No extra non-contact time was offered. All candidates undertook a demanding interview and some colleagues did not make the final cut. Specific feedback was given to those members of staff who didn’t make it and this was also a key part of the learning process. The programme has tended to run from January to January. Colleagues indicate whether they will continue or drop out from the scheme and then a new SSLT is recruited, depending on SSLT is very small as two of the cohort are now working on the SLT itself. The tasks, responsibilities and activities undertaken by the SSLT have been extremely varied. SSLT members are set tasks, which enhance their current skill-sets, and they have an existing SLT member as a mentor to provide weekly feedback and advice. In many cases, tasks are set on a long-term basis and deliberately designed to take people out of their comfort zones. In so far as pastoral versus curriculum roles still exist, colleagues with pastoral responsibilities tend to work on more curriculum-based tasks and vice versa. It is not easy to generalise but the aim is to provide weighty, significant, whole-school tasks that can be completed within the yearly cycle and that enhance the shadow’s CV and skill-set as well as the school. All shadows attend SLT meetings and the relevant governors’ committee meetings. They may be called out to deal with truculent students and, cover permitting, they often accompany SLT colleagues to external meetings. It all adds to their understanding of the rich tapestry that makes up the life of a member of school senior leadership. Other SSLT have followed up on whole-school data analysis, behaviour management policies, marketing and advertising, Year 9 options – the list goes on. I have worked with two different shadows, both of whom have been excellent. Katherine was a fast-track linguist colleague who joined the first SSLT cohort in 2008-09 in her third year of teaching. At the time, we had 13 NQTs and it was an obvious move to set her a task that involved mentoring, observing and monitoring them. She also assisted the large number who were following a master’s course. It provided her with a range of personnel management tasks, some of which became complex and allowed her to interact with staff members well outside her normal range of colleagues. Katherine was also interested in pastoral work, so she took charge of training new staff and those who needed a bit of a lift to their work as a tutor. Among a range of other tasks, she produced a training booklet for tutors at St Birinus and addressed meetings for NQTs, people on the Graduate Teacher Programme and our large number of student teachers. During her year on the SSLT, she applied for head of department roles at other schools, and was offered a post at one school as both head of modern foreign languages and head of year. She has since gone on to become an assistant head with responsibility for staff development. Ann-Marie, my second shadow, is a more experienced teacher and is currently a talented year leader looking to move into an SLT job locally. In keeping with her level of experience she was given a weightier task to start with and took over the NQT programme completely, which has been very successful. It is helping to fill a gap in professional development that is not adequately catered for elsewhere and provides unique opportunities for ambitious and able colleagues to gain hands-on experience to prepare them for the next step in their career. In the last academic year we have added another element to the SSLT. We work closely on continuing professional development (CPD) with the Ridgeway Partnership, a group of schools and academies around the Oxfordshire stretch of the ancient Ridgeway track. We are really pleased to be working within this local context and are exploring further opportunities for the next academic year. There have been some issues with the scheme. Time taken by SSLT tasks can be a burden on already busy people, so we will be looking at how to allocate extra timetabled slots for colleagues to carry out their tasks. Sometimes SLT meetings simply need to be held without the shadows, so we have implemented a separate SLT/SSLT meeting structure. But SSLT colleagues have benefited professionally from being part of the scheme and have experienced professional development opportunities well beyond what would usually be available. The fact that nearly half of our shadows are now in SLT jobs would seem to highlight the value and effectiveness of the programme. Ridgeway Partnership SSLTs prepare people for the next step in their career. Perhaps you may benefit in the near future and employ one of them in your SLT. Jim Fuller is deputy head at St Birinus School, Didcot.